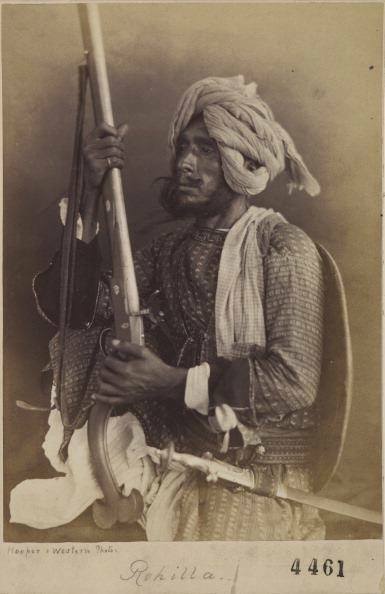 Those who migrated from Roh (Pakhtunkhwa) to India in 17th and 18th century, were designated as Rohillas by Indians. 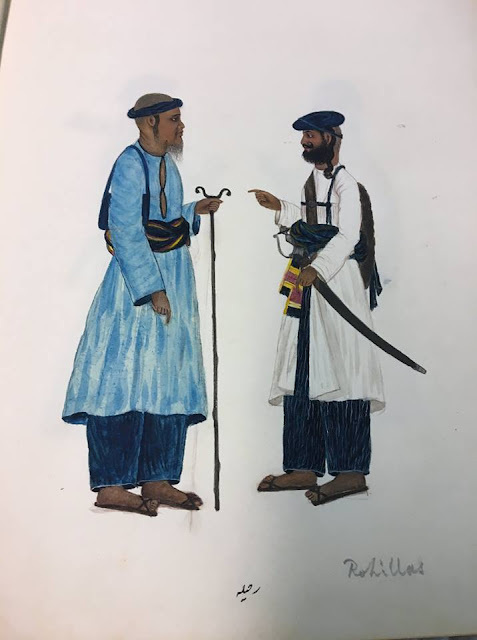 Pashtuns in their native lands do not call themselves Rohela (روهیله) , the suffix -ela is Indian nomenclature (for example Bundela, Baghela etc). The Pashtuns spoke of their land either as Pashtunkhwa or Roh. Khulasat-ul-Ansab described Roh as "the large tract of country belonging to, and inhabited by, the Afghans, the eastern boundary of which extends to Kashmir, and the western to the River Hirmand, a distance of two-and-a-half months’ journey ; and on the north its boundary extends to Kashkar (Chitral), and its southern boundary to Baluchistan. It therefore lies between Iran, Turan, and Hind; and its people are termed Rohilahs" . 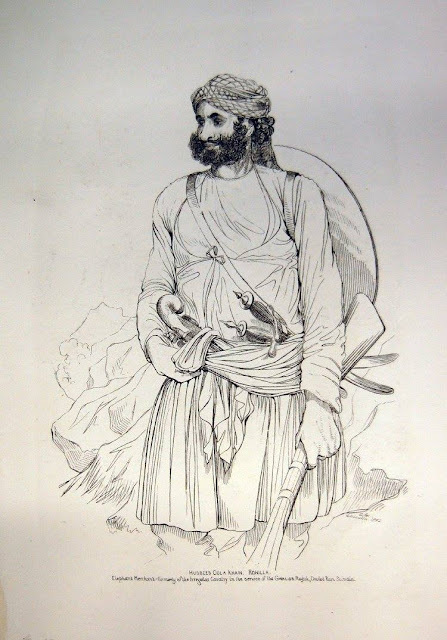 The real founders of Rohilla power in India were an Afghan adventurer, named Daud Khan, who arrived in India immediately after the death of Aurangzeb, and his adopted son, 'Ali Muhammad Khan, who succeeded him as leader of a band of mercenary troops. Ali Muahmmmad Khan carved out for himself a principality in Ketehr (U.P, india). 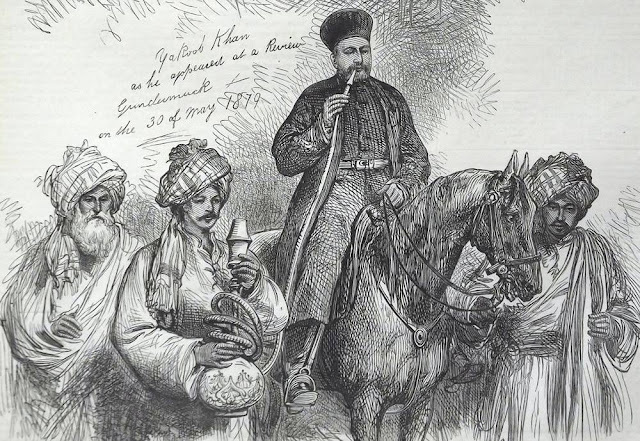 It was during life time of Ali Muhammad Khan that Katehr came to be known as Rohilkhand. Rohilla rule was terminated in 1774 when the country was overrun by British. Rampur was the only Rohilla principality which survived as a princely state under British rule. 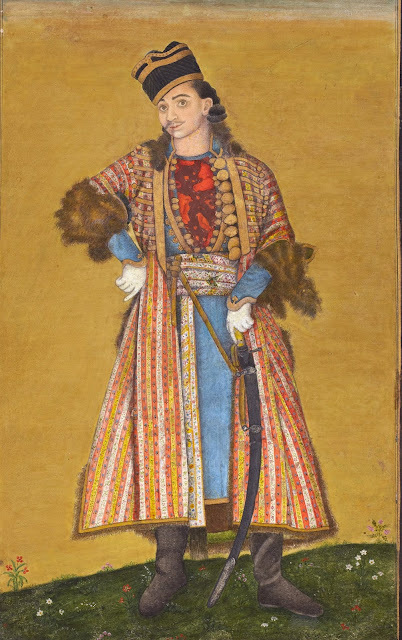 Rampur state was created by Faizullah Khan, a son of Ali Muhammad Khan. Rohilla soldiers, c.1830-1840. British Library. 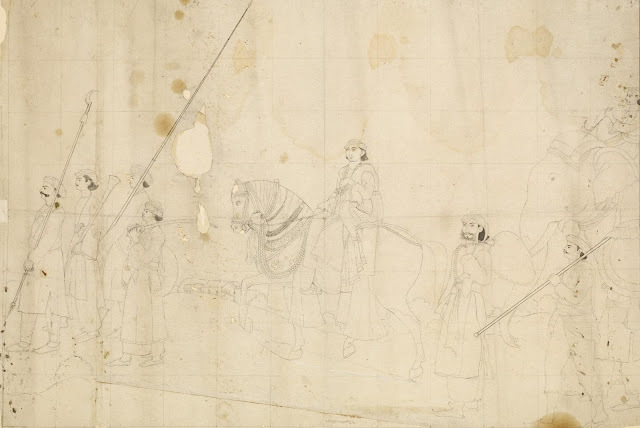 A brush drawing in ink on paper, depicting Nawab Yusuf Ali Khan of Rampur (Rohilkand) on horseback, with retainers c.1830.